Lauri has worked in the music business since 1985. She started working in a music store when she was in high school. Her parents never played musical instruments but encouraged her to play instruments by taking her to lessons and listening to her practice. Lauri has an Associates degree from UW Rock County and a Bachelors degree from UW Whitewater. She plays the violin, piano, and organ. She has also “played with” the cello, harpsichord, accordion, trumpet, guitar, ukulele and drums. Lauri loves traveling...with maps. She's only used a GPS twice: the first time it directed her through a field in Ohio, and the other time into the ocean in California! Brad is the Store Manager at Knapton Musik Knotes, and he thoroughly enjoys the opportunity to pass along his love of music to people of all ages. Brad has worked in the music industry since the mid 90’s. 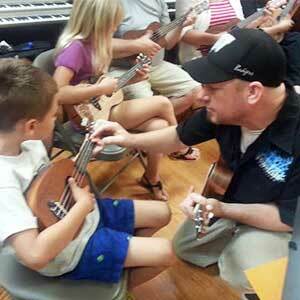 He teaches guitar, bass, ukulele and banjo—he also enjoys playing drums and piano. He’s the guitarist/back-up vocalist/dancer in the Local Band 2211. When he’s not playing or teaching music, Brad enjoys all different types of sports. GO PACK GO! In his younger years, Brad had long curly locks, but now….he does not. Ed has played guitar off and on for over 40 years. He is a guitarist and the lead vocalist in the local band "Curb Appeal" which was started from a Knapton Musik Knotes Rock Camp. He also plays in his church's Praise Band. Ed has over 32 guitars, and he is still "shopping" every time new models arrive. In addition to collecting those, he also really likes shoes, owning around 100 pairs! Ed also has a weakness for Mentos, and we can bribe him to do just about any chore around the store for them! Another fun fact: Ed appears dancing in a Duran Duran video "The Reflex" at 1:29-1:33. The next time you see him, ask him for his autograph! 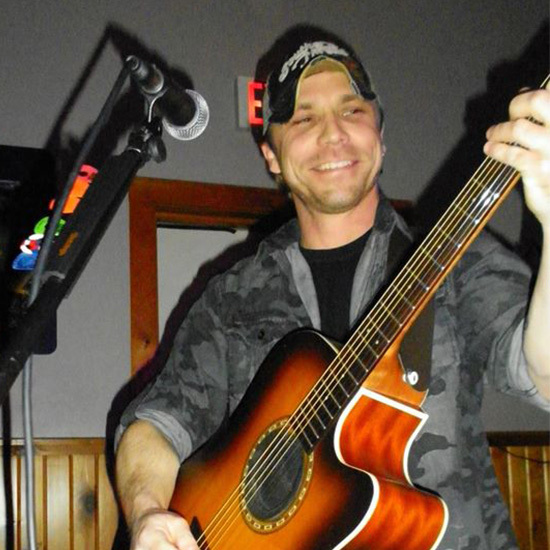 Jerod started his musical journey with his father at a very young age, over 30 years ago. 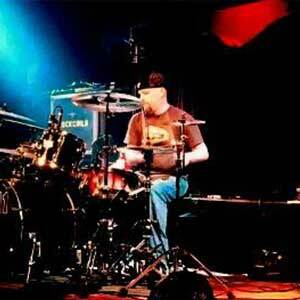 He currently plays in the local rock band "2211" and has worked with many other area bands and musicians. 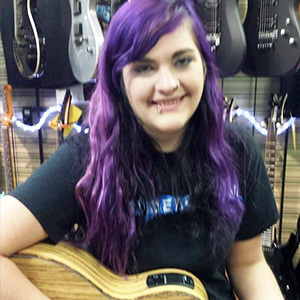 Robin began playing the guitar at age 15 when she started taking lessons at Knapton. She fine-tuned her performance skills with Rock County 4H, Show Choir, and Heat Wave. 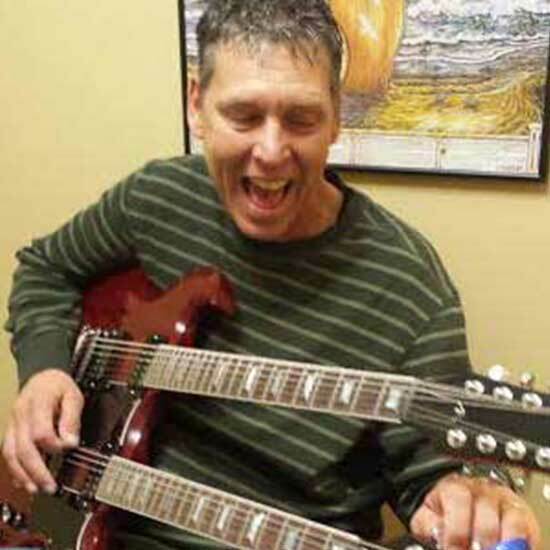 Robin plays lead guitar and sings in the local band Curb Appeal, which originated as a Knapton Rock Camp band. When she's not teaching or playing music, Robin stays busy with modeling and participating in Cosplay. Robin's favorite food is artichoke and her greatest regret in life so far is that she never learned how to whistle! Travis is our in-house repair technician, and he sometimes steps in as a substitute teacher for lessons. He started playing guitar when he was 12 years old, and he remembers liking to tinker and repair things ever since an early age. His dad worked in the aviation field, so he grew up loving the challenge of problem-solving. 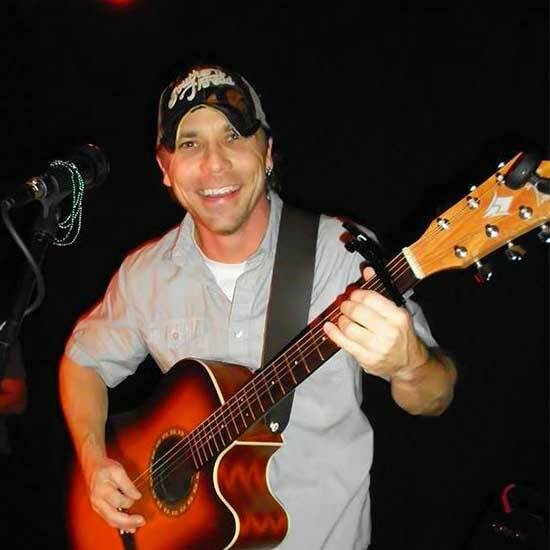 Travis actively plays in a local band, Dusty Bottoms, and he has two girls ages 11 and 16. He loves riding his Suzuki motorcyle, enjoys working out, and is shamelessly addicted to sugar and caffeine! Jean Dickinson is an independent contractor who teaches Violin, Viola, Cello, and Bass at Knapton Musik Knotes. She is licensed through the state of Wisconsin to teach K-12 instrumental music and specializes in strings. Jean is the Conductor for the UW-Rock County Youth Orchestra, and she's a founding member of the Whitewater String Quartet. She has participated as a player in the UW-Rock County Chamber Orchestra, Beloit Janesville Symphony, Choral Union Orchestra, Southern Lakes Orchestra, Wisconsin Chamber Orchestra, and the Waukesha Symphony. The worst arrangement Jean ever did was rap music on the cello/violin. As you can imagine, it didn't work out very well! When she's not teaching or playing, Jean collects mid-century jewelry and odd watches. She's an avid gardener, loves to fish and bike, as well as canoe. She hopes to someday master jump-roping and the Pokeman card game that she plays with her grandson! Robyn is an independent contractor who teaches voice and piano at Knapton Musik Knotes. Her passion for music, combined with her experience and education, provides a unique opportunity for students of all ages. Robyn holds a Bachelor of Music Degree in Voice Performance with a Piano Minor from Illinois Wesleyan University, and she is currently the only certified Speech Level Singing Instructor in the Midwest. Robyn and her husband Jim are the proud parents of two boys that are graduates of Rock Prairie Montessori School where she serves as Director of Operations. In her spare time she enjoys gardening, exercise and spending quiet time with her family. Zachary Peterson, a Beloit-based violinist, has an extensive background in performance. He is comfortable teaching violin, viola, and cello to all ability levels and ages, and he is happy to take on adult students as well as absolute beginners to very advanced students. He is also comfortable teaching people in fiddle and non-classical styles. Zachary holds degrees from The University of Wisconsin Oshkosh (Bachelors 2006-2010), The University of Western Ontario (Masters 2010-2012) as well as Roosevelt University (Performance Certificate 2012-2014). After completing his degrees Zachary went right into a two year membership with the Civic Orchestra of Chicago, one of the countries leading training orchestras. 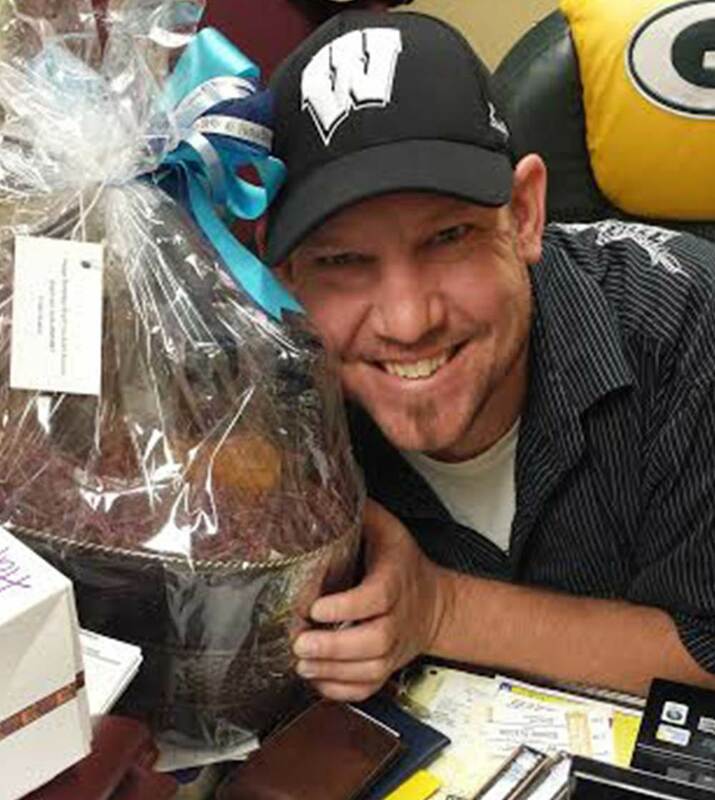 Zachary grew up in the Beloit / Janesville area where he studied with Lori Davis (Wier) and John Pickart, and later with Janet Chisholm in Madison. After graduating High School, Zachary went on to study with Klara Bahcall, Annette Barbara-Vogel, Jaime Weisenblum and Stefan Hersh. While studying at the collegiate level, Zachary received various honors and opportunities. He was a featured soloist with both the Western Ontario and UW-Oshkosh Orchestras playing the Mozart Adagio and Rondo (Western) as well as Dvorak’s violin romance (Oshkosh). Other honors include being a UW-Oshkosh Honors Recitalist as well as passing his Master’s Degree final recital with a mark of Distinction, a mark given to exceptional student recitals the the University of Western Ontario. Zachary has also had the honor of working with as well as performing alongside some of the leading classical musicians of our time. During the end of his time at UW-Oshkosh, Zachary had a teaching studio at Mike’s Music in Fond du Lac, where he taught students aged 6 - 60. While at Roosevelt, Zachary’s quartet was given the honor of playing the Mozart Viola Quintet with Julliard Professor of Viola Toby Appel. While at the Civic Orchestra of Chicago, Yo Yo Ma worked extensively with the Orchestra giving masterclasses, workshops and coaching, which during the Bach Brandenburg Concertos Marathon Concert in 2015, Mr. Ma sat in with the Brandenburg group Zachary was playing in. Also while in Civic, Zachary played under many influential conductors including Riccardo Mutti, Charles Dutoit and Sir Andrew Davis. At Roosevelt, Zachary performed in Masterclasses taught by concert violinists James Ehnes and Augustin Hadelich. Outside of his training, Zachary has organized and performed in many solo recitals and concerts. He has a passion for finding and performing obscure and under-performed masterpieces and championing lesser known composers. In addition to classical performance, Zachary is an accomplished fiddler, which he hopes to showcase more in the coming years. Karl was Brad Lutton's very first guitar teacher! Since October of 1985, Karl has given over 50,000 lessons! He teaches guitar, bass guitar, ukulele, banjo, and drums. When Karl was young, his interest in music was sparked by his father whose country band practiced every week in the home. 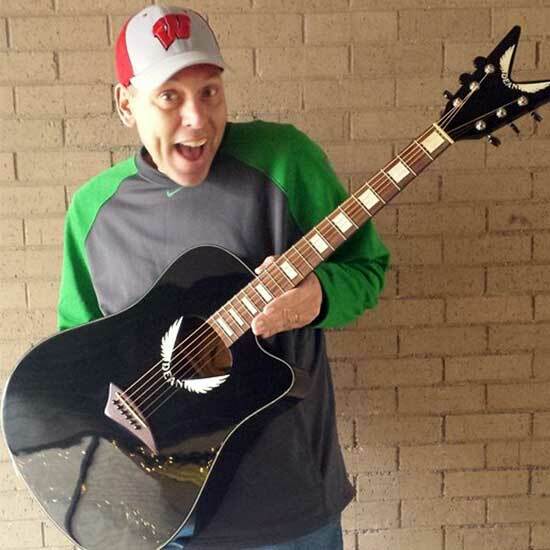 Sharing this love of music with students is Karl's favorite part about teaching. 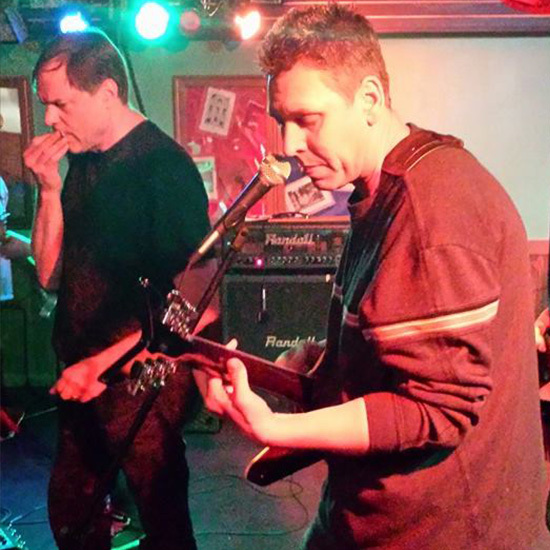 Karl has played in countless bands over the years! Back in the mid-90's, he even spent three years writing the World's Greatest Chord Book, just for his own personal use! Teegan has experience teaching music to elementary and middle school students. His love of music was developed by his choir teachers in middle and high school where he received Best Male Soloist in show choir, and he won the musical theater division at NAT. 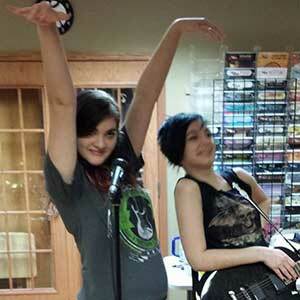 Teegan now teaches guitar and piano at Knapton Musik Knotes. He loves helping new students learn and grow as musicians! In addition to being musician, Teegan also loves hockey and played it for 14 years!